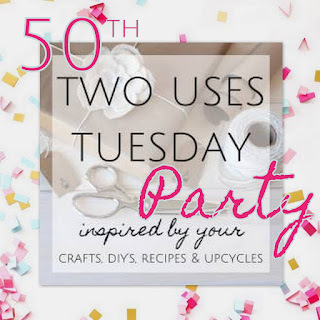 Two Uses Tuesday Turns 50! This year has simply evaporated and the 50th Two Uses Tuesday is here! 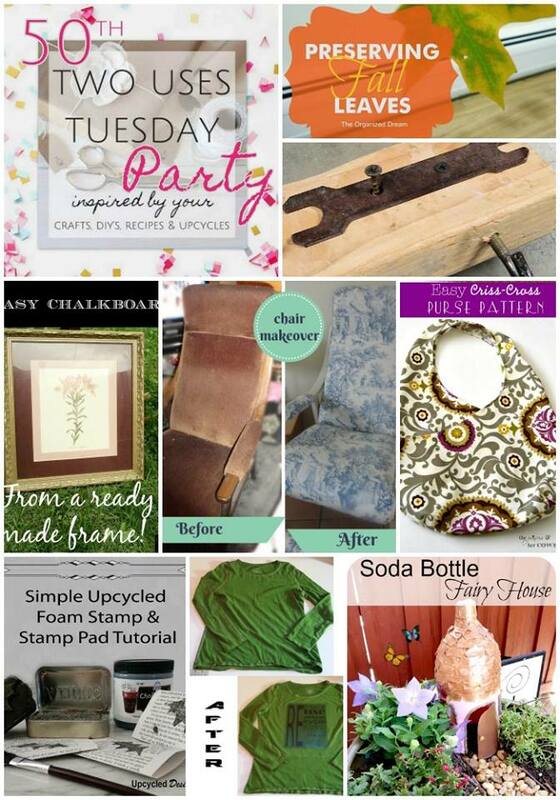 On the 7th of October 2014 the very first Two Uses Tuesday Linky party was launched. That 1st party had a grand total of 2 linkers. 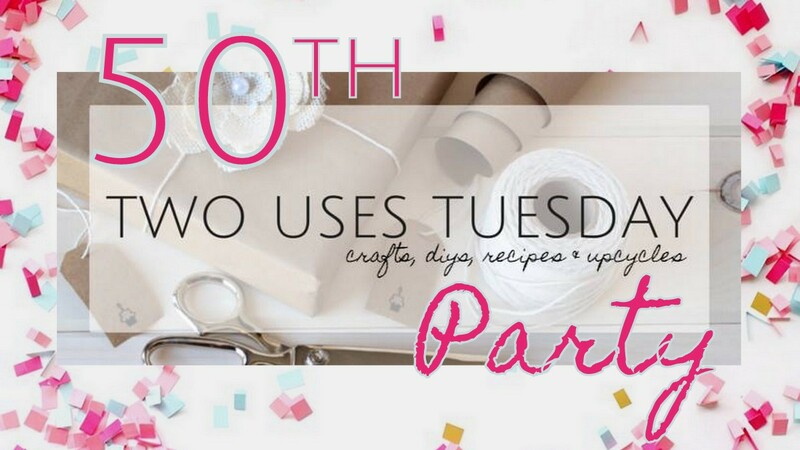 Since then well over 5000 links have been shared at #2usesTuesday. Stella joined Sarah as co-host for Two Uses Tuesday just in time to celebrate the 21st Party. We love working together, it has been a blast and we have helped each other so much since we started to work together. Sarah has a positive impact on my blog every single week and helps to keep me on track and focused. 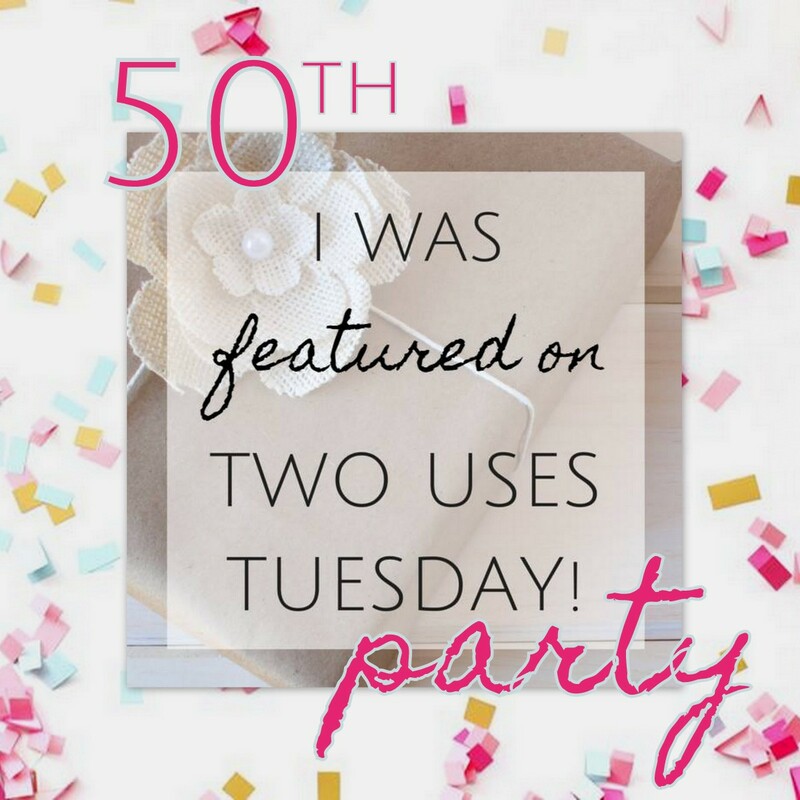 Sarah is more then just a blog party partner, but a great friend who enriches, embellishes and purfylles my life in so many ways. 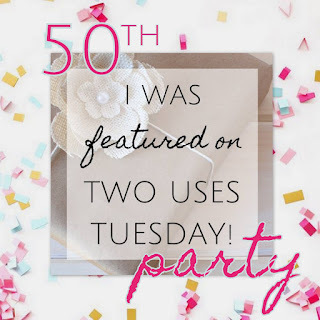 More then that, through Two Uses Tuesday I have met so many wonderful bloggers and I'm thrilled to be celebrating this milestone party with you all. To Celebrate we are taking a walk down memory lane and in addition to the usual Features we have some special Retro features too. 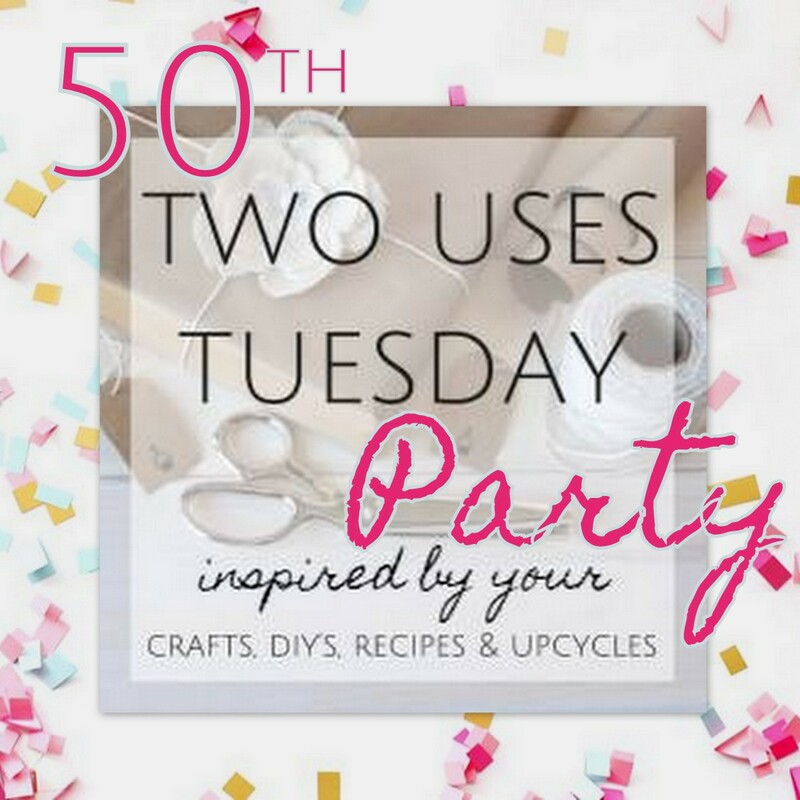 ♥ Grab your special 50th party button and celebrate with us. 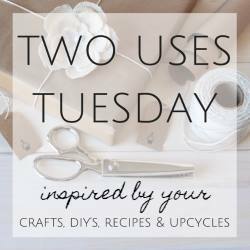 Let's make this the best #2UsesTuesday ever and link up something extra from your archives. Tip: Find a great blogging buddy!!! Robin co-hosts Pinbellish with Sarah and myself every weekend. Here's Sarah's Retro favourite links from the 2nd party. Here are Stella's Retro favourite links from 3rd party. congrats on #50!! and here's to a zillion more!! have fun - btw, cleaned out THREE bags from the closet and drawers!!! woot! Three bags! That's awesome. I bet it feels amazing to have all that space in closet now. Hubby was like where do you want these bags? I said load em up and take them to Goodwill. As soon as he walked out I did feel so much lighter and happy that all those clothes were gone! Some hadn't been worn in over 5 years! So yeah, now to restrain myself from buying new lol!! How goes your clean up!?!? Its strange how awesome it feels. I wonder why that is? I am screwing up my courage to head into the fray right now in fact. The plan is to actually finish by the end of this year. Congratulations on your 50th. Thanks for all your work hosting. It can't believe how quickly it's come around. Thanks for celebrating with us! I was linking there while you were linking here =) The time zone difference still gets me confused as to what day it is. Congrats Stella!!! Thanks for the party!!! 50 sounds so old 0_o but that's still young and funky in linky land =) Thanks for celebrating with us! Congrats on the big 50! It's lovely to see the story of how you all joined over the year and the party has grown. Thank you so much for featuring my doily in a frame, It is such a boost when people say they like what I've shared. It made me wish I had found time this year to spend on lace making. My last project is still unfinished. Somehow it doesn't surprise me that you enjoyed the party history when you've taken the time to honour your own bit of doily history =) I'm really glad you liked it. Congratulations and Happy 50th! 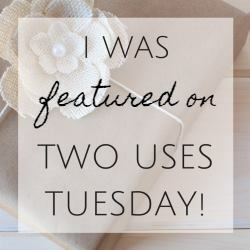 Being somewhat new to #2usesTuesday, I think it's neat to go back and check out some of the first projects shared. May there be many more! Congrats and I hope for 50 more. Thanks for hosting and have a great week. 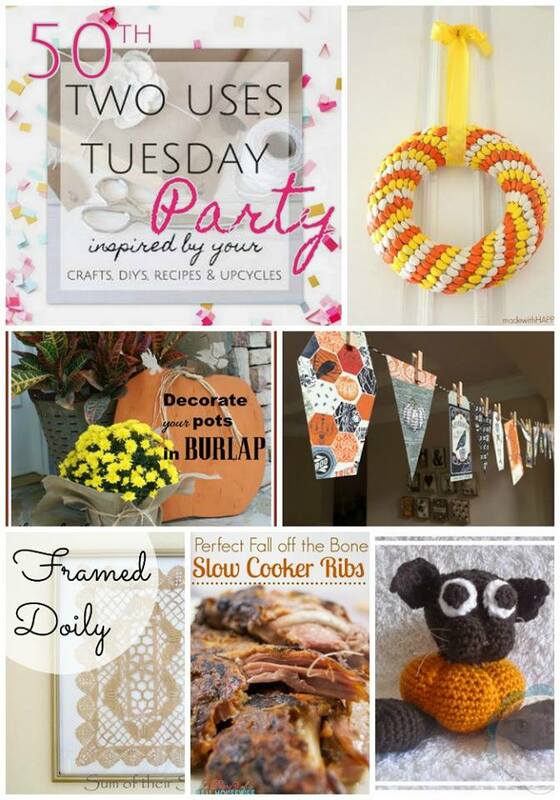 Congrats to you both; always great to see so many crafts on the linky. Congrats on the BIG 5-0!!! Woo hoo!